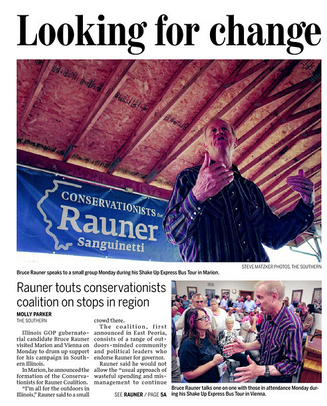 Bruce Rauner Pushes Forward With "Conservationists Coalition"
We've long held that being 'for' the environment can and should be an issue 'owned' by just about every Republican candidate up and down the ballot. So, we're glad to see Bruce Rauner come out with his own group of Conservationists supporting him. Gubernatorial candidate Bruce Rauner and running mate Evelyn Sanguinetti today announced the launch of the Conservationists for Rauner Coalition. The coalition consists of a broad range of community and political leaders who endorse Rauner for Governor. The group includes: Mary Jo Trimble, Mike Kepple, Larry Closson, Brent Manning, Neal Graves, Wayne Rosenthal, Tim Sickmeyer, Richard Mottershaw, Glenn Sanders.